New Zealand’s Alpine Fault is a seismically active, “crust-busting” plate boundary fault. I’ve analyzed quartz grain size data from ~250 rocks spanning 170 km of the fault. In the plot above the area of the circles correlates with the area percentage of samples occupied by the grain size. The data were collected “blindly” with no judgements regarding the recrystallized state (e.g. unrecrystallized, late recrystallized, etc.). There appear to be two grain size populations. The majority of the quartz is fairly coarse grained (>40 µm). The coarse grains show minor size variation along strike, changing from an average of 60-70 µm in the south to 40-60 µm in the north. I interpret that this quartz recrystallized during steady-state ductile deformation at deep levels of the Alpine Fault. The recrystallized grain size piezometer predicts a peak stress of 30–60 MPa associated with this recrystallization, comparable to a stress estimate from plate-scale numerical modeling of the Alpine Fault (Liu and Bird, 2002). A second population of finer recrystallized grains (4–40 µm) overprint the coarser grains in most samples. Recrystallized grains of this size typically comprise <10% of quartz by volume. 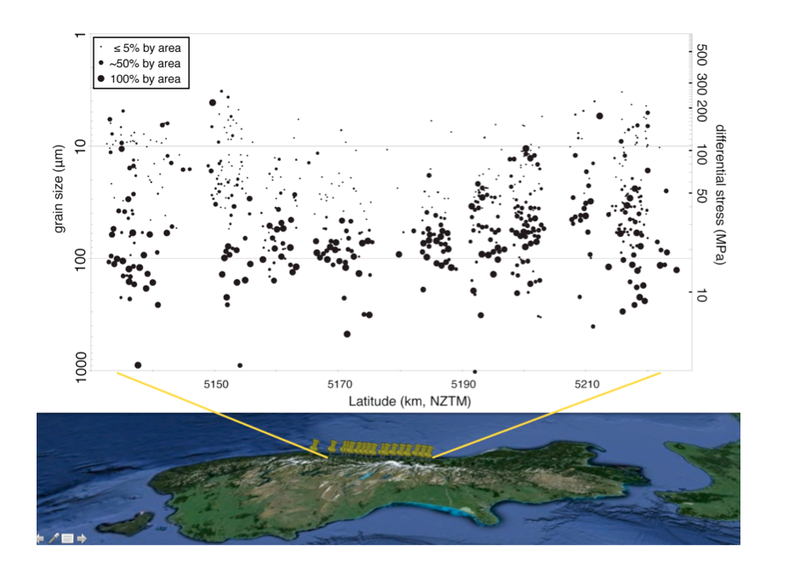 The average grain size of this population increases significantly in the central region of the Alpine Fault where uplift rates are rapid and the geothermal gradient is elevated. Peak stress calculated in this area using the fine-grained population is ~60 MPa. In areas of slower uplift to the north and south, peak stress estimated from the fine-grained fraction is ~100–200 MPa. The fine grains record transient, high-stress events on the Alpine Fault since: 1) the stress magnitudes are significantly higher than estimated for steady state deformation on the Alpine fault (Liu and Bird, 2002) and other major faults, 2) strain occurring at these high stresses was minimal based on the small extent of recrystallization and the fact that significant deformation at these stresses would generate a massive thermal anomaly that has not been identified, 3) high concentrations of the small recrystallized grains are found in the vicinity of pseudotachylites, and 4) transient stresses of this magnitude have been predicted to occur during post-seismic deformation along the Alpine Fault (Ellis and Stöckhert, 2004).